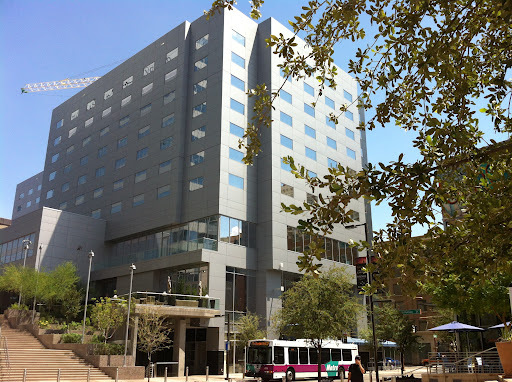 Five years after its suburb Scottsdale scored a Kimpton hotel, Downtown Phoenix has finally added one of the prestigious properties to its Downtown lodging mix. Most of the chain’s properties reuse existing structures, but Kimpton opted for a new building for its Palomar Hotel here. It’s a plain metal box with little of the character of the needlessly demolished hotel that existed there long before CityScape was conceived. 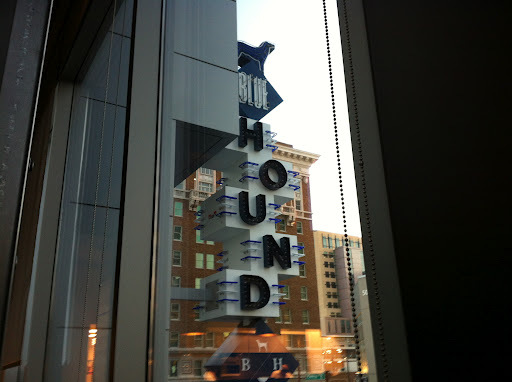 Nevertheless, the Kimpton spirit is still evident in the new hotel’s destination restaurant, Blue Hound Kitchen & Cocktails. Like almost everything at CityScape, Blue Hound is harder than it should be to find. The address is on Jefferson Street. While it is possible to enter from that side and take the elevator upstairs, the better strategy for most customers is to enter from Central Avenue on the block between Jefferson and Washington. Look for the staircase on the east side of the street near the new Jos. A. Bank menswear store. It’s just a block from the Central / Washington (westbound) and Jefferson / First Avenue (eastbound) light rail stations. The restaurant has used the phrase “contemporary American gastro-lounge” to describe itself. That sounds a little like a place to recover after endoscopy, but the phrase actually reflects variety of items that can be served in either large or small servings to facilitate sharing. It also speaks to the restaurant’s emphasis on handcrafted cocktails, served both in the restaurant itself and on a nearby rooftop bar. 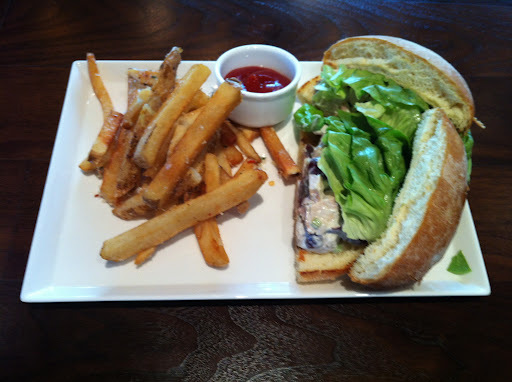 The American part reflects a variety of influences from regional cuisines all around the country. As at most hotel restaurants, the menu becomes more innovative and adventurous as the day goes on. Breakfast is a litany of familiar favorites that will serve hotel guests well but not necessarily draw wider business from beyond. Lunch steps up the game a little with a section of shareable plates and a larger array of salads, sandwiches, and flatbreads. A smoked chicken salad sandwich is probably more flavorful than the chicken salad you grew up with. Flavorful meat comes shines through the dressing and the resulting mix holds its own inside a potato bun. Tabouleh salad with shrimp features three monster prawns, large grains of bulghur, and big sprigs of arugula instead of parsley. It’s hard to distinguish from the couscous salad unless one looks closely at the grain shape. The difference lies in irregular bulghur grains vs. little spheres of Israeli couscous. The latter can be topped with grilled chicken, shrimp, or steak. The last choice comes tender, slightly charred on the outside, and slightly pink on the inside.This is all good stuff coming out of executive chef Stephen Jones’ kitchen, but it gets even better at night. 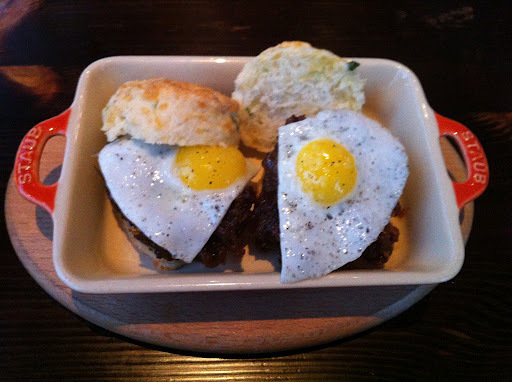 Blue Hound’s staff use the phrase “American tapas” to describe the dinner menu. 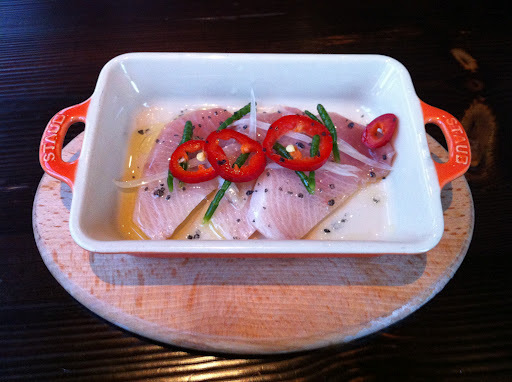 That’s certainly true of the hamachi crudo, a light and refreshing small bite that comes in a miniature skillet like many of the shareable dishes. It’s a simple preparation that allows the fish to speak for itself with some sliced peppers in a supporting role. Roasted cauliflower comprises florets of the cruciferous vegetable enlivened with pine nuts and currants. Scallion biscuits are fluffy and nicely paired with twin quail eggs and a bacon jam that is not the pork overload it sounds like. Other dishes veer more in the direction of traditional dinner entrees. 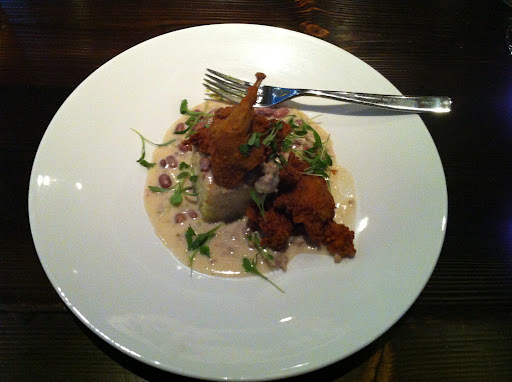 Kentucky Fried Quail is a flavorful, batter-fried bird for one paired with rich gravy and cornbread. The latter is described as containing foie gras, but any presence of goose or duck liver in a subtle one, and that’s probably for the best. This dish is hearty enough as is. 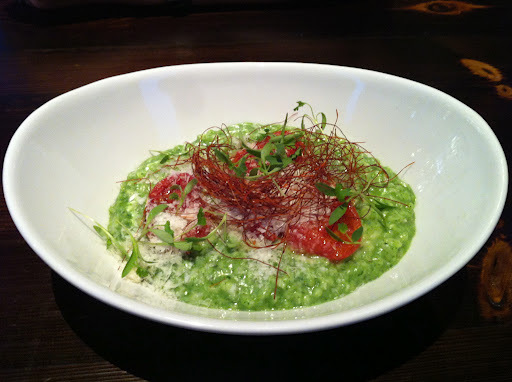 A meatless entree of basil risotto is lighter but equally flavorful, not only from the named herb, but even more so from roasted Campari tomatoes, chile threads, and shaved parmesan. Desserts at Blue Hound are few in number but generally intense in taste. 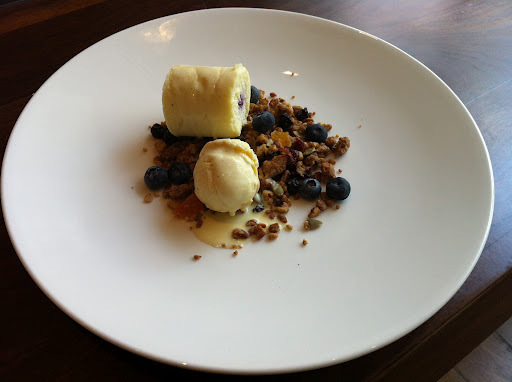 The lemon blueberry cheesecake is a little cylinder of mousse instead of a traditional slice. The addition of granola and fresh blueberries makes sense, but an added scoop of ice cream, no matter how good, seems unnecessary. The “Cake N Shake” is a Nutella concoction presented in a cute miniature milk bottle with brownies on the side. The whole wheat donut holes are the simplest and maybe the best of the sweets. 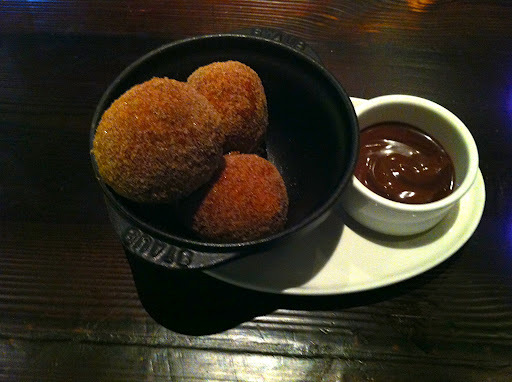 Their cinnamon flavor pairs nicely with the dark chocolate dipping sauce. Cocktails range from beer-based one such as the summery Rising Sun with Lagunitas IPA, tequila, and pineapple to stronger drinks based on spirits like gin. A “natural daiquiri” is a model of simplicity with strong rum and tart lime balanced by a little sweetness. For the lunch crowd, there are some creative alcohol-free drinks that refresh without intoxicating. The strawberry honey infused bitter lemon soda is not really bitter, but tart and bubbly instead. Of course, there’s a reasonably good selection of wine and beer as well. With these strengths, Blue Hound has had a strong start in Downtown Phoenix, but one note of caution is in order. The Kimpton restaurant in Scottsdale, Taggia, started out with noted chef Claudio Urciuoli at the helm. Urcioli, now at Noca, left the hotel after a short while and took some of the restaurant’s distinctiveness with him. It remains to be seen if Blue Hound can continue to balance the sometimes cautious tastes of business travelers with a good chef’s sense of adventure. If it can, Phoenix will have the Kimpton destination restaurant it deserves.